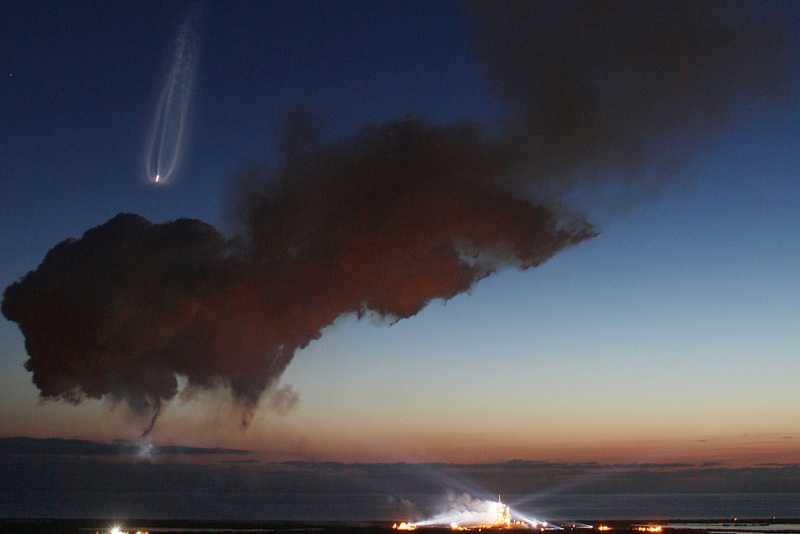 Space Shuttle Discovery is seen streaking into space (to the left) as a plume of smoke floats through the air after it blasted off from launch pad 39-A at the Kennedy Space Center on April 5, 2010, in Cape Canaveral, Florida. The bottom line is, nobody is more committed to manned spaceflight, to human exploration of space than I am … [But] we’ve got to do it in a smart way, and we can’t just keep on doing the same old things we’ve been doing and thinking that’s going to get us where we want to go. Step by step, we will push the boundaries not only of where we can go but what we can do. In short, 50 years after the creation of NASA, our goal is no longer just a destination to reach. Our goal is the capacity for people to work and learn, operate and live safely beyond the Earth for extended periods of time.